120 years ago Charles Duryea claims to have driven the first auto through Springfield Massachusetts. And, just nine years later, in 1901, New York became the first state to require automobile license plates. For some reason it took a little longer for cars to catch on in the West. This painting captures the crossover period when the West was transitioning from frontier to settled status. The “T” is a 1909 Ford Touring car and was quite the beauty, but it really wasn’t intended for the Western frontier. I can’t help but think that more than one rancher must have come to the aid of stranded drivers in their newfangled machines. 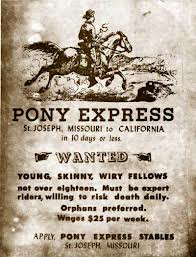 While the Pony Express lives on today as an example of romance, adventure and bravery from the American Frontier, the Express only operated for 18 months – from April 1860 to October 1861. 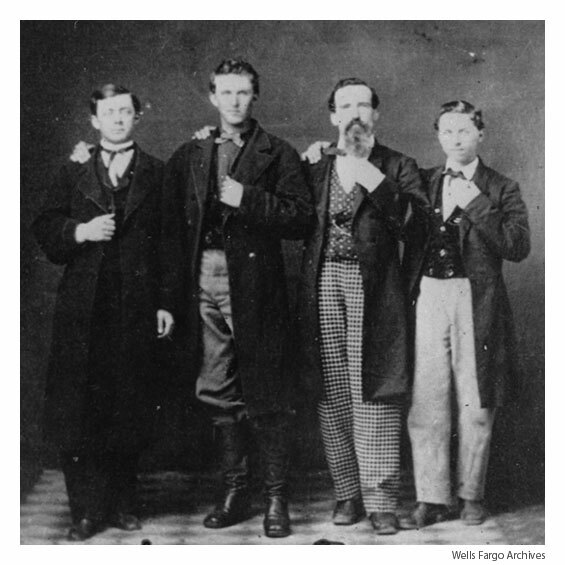 Perhaps most interesting to me is the fact that the “men” were often just teenaged boys, the horses were frequently mules and the riders usually carried business correspondence, sometimes newspapers, but almost never love letters! After all, $5 an ounce was extremely expensive. And, while replacement riders were sometimes unavailable, usually riders traveled less than 20 miles at a time. Legend has it that riders were given rifles, but it was probably a just small pistol or even a knife. After all, rifles are heavy, and every ounce counted when riding for speed. Riding for speed and keeping weight light, may be where the legend came from that the company posted ads for riders which read: “Wanted: Young, skinny, wiry fellows, not over eighteen. Must be expert riders, willing to risk death daily. Orphans preferred. Wages $25 a week.”. This picture is great, but historians actually haven’t turned up a genuine ad from that era. None the less, if I had seen this, I’m sure I’d have answered it. 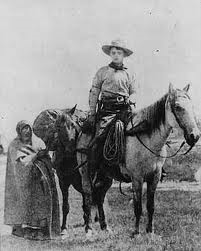 Some of the riders parlayed their experiences into quite interesting tales, the most famous of which comes from Buffalo Bill. However, the tale of “Bronco Charlie” Miller was pretty entertaining… and the most embellished over the years. A performer with Buffalo Bill’s Wild West Show, Bronco Charlie was probably never a Pony Express rider, but he did fabricate a great life story where he was born on a buffalo robe, and “delivered by an Indian squaw” in Hat Creek, California sometime around 1849 or 1850. No birth certificate was found for Charlie Miller, but he was believed to have lived to the ripe old age of 105. I’ve often wondered what motivated these young men. Was it the money, the adventure or a little bit of both. I like to believe that had I lived back then, I would have been a Pony Express rider, how about you? 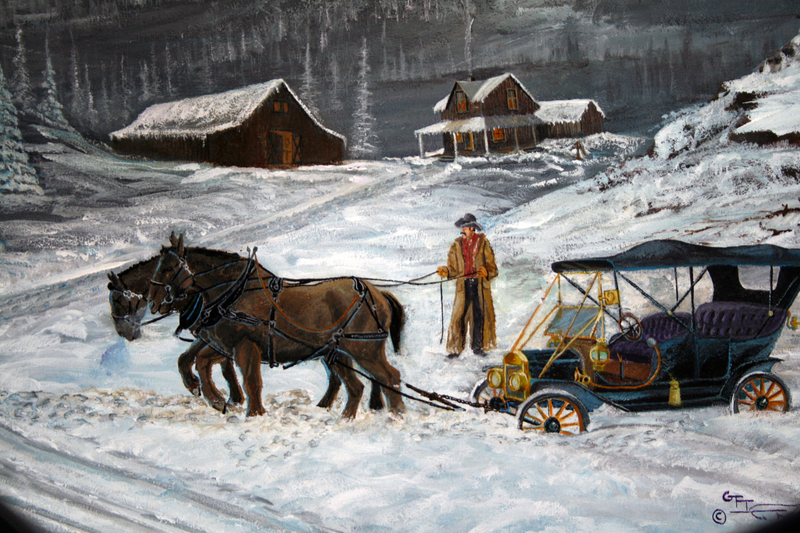 “Crossing the Yellowstone” – acrylic on hardboard. 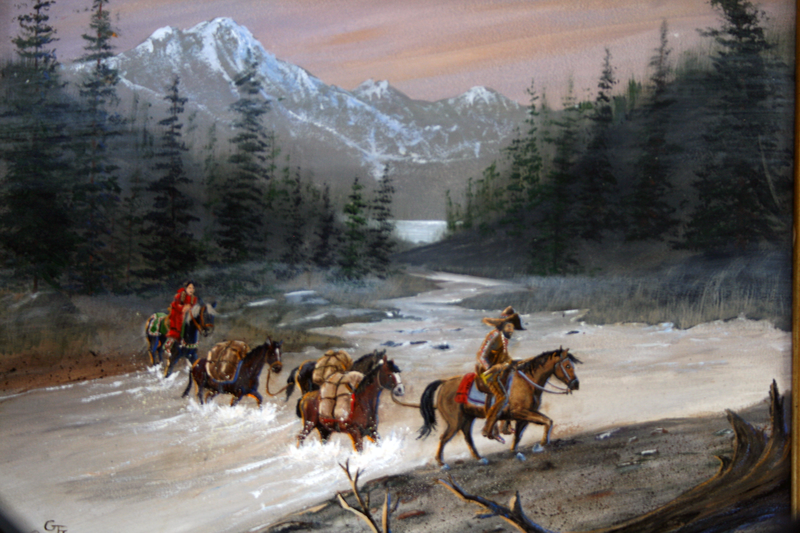 Inspired by the adventures, trials and freedom of the Mountain Men, “Crossing the Yellowstone” represents both the vastness of the Rockies and the companionship that Free Trappers needed. It also symbolizes the trapper’s unfettered freedom to go and do as he pleased. Being a century out of step is no fun. After reading Crittenden’s “History of the Fur Trade”, also known as the “bible” on the fur trade, I knew I had been born a hundred and fifty years too late. His narrative stirred within me a desire to see the elephant, as the Mountain Men called going out to the “Shining Mountains.” Those Rocky Mountains held a wealth of furs more valuable than precious metals or black gold. They also held one more thing – adventure, the kind of adventure that tests a man’s character, a man’s strength and a man’s courage. Their vastness allowed a man to go in any direction unhampered by the rules of men. A man was truly free. That’s what I wanted and could not have. Thru my art I try and tell the story of the men and women that were… their lives, their adventures and the beauty of this land.